When war devastates their country, a boy and his parents are forced to flee to another country far east, where they must live in a small room shared with another couple. Food is scarce. But one day, when father goes to the bazaar to buy bread, he comes home with a map instead. The boy and his mother are furious, they are so hungry! But the map floods their cheerless room with colour. The boy becomes fascinated by it and is transported far away without ever leaving the room. Father was right to buy it, after all. 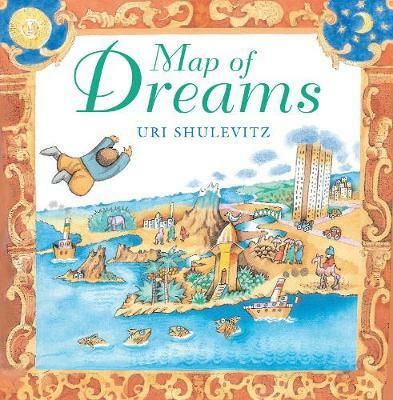 In this story, based on his childhood memories of World War II, Uri Shulevitz tells how a map and his imagination took him far away from his hunger and misery. Winner of the Caldecott Medal, Uri Shulevitz is one of the most distinguished picture book creators in the US. "In a work more personal than Caldecott Medalist Shulevitz (The Fool of the World and the Flying Ship) has ever before offered, he summons boyhood memories of WWII and shows how he learned to defeat despair. Fleeing Warsaw shortly after the Germans invaded in 1939, the child Uri and his parents eke out a miserable existence in Kazakhstan. One day, Father comes home from the bazaar with a huge map of the world instead of food. Uri, only four or five, is "furious," and as the couple sharing the one-room hut eats that night, the husband noisily chewing a crust "as if it were the most delicious morsel in the world," Uri hides under his blanket to cover his envy and rage. But shortly after his father unrolls the map, the boy is swept away by exotic place-names ("Okazaki Miyazaki Pinsk,/ Pennsylvania Transylvania Minsk! "), picturing them remote from his hunger and suffering. As Uri taps into his artistic imagination and draws maps of his own, Shulevitz's illustrations shed their bleak, neorealist feel, and his beaten-down younger self becomes a Sendakian figure-sturdily compact, balletic, capable of ecstatic, audacious adventures. The story and its triumphant afterword demonstrate that Uri masters much more than geography; he realizes the importance of nurturing the soul. Ages 4-8. (Apr.)" Uri Shulevitz lives in New York City, and has been writing and illustrating children's books since 1963. He has won the Caldecott Medal once, and also been awarded two Caldecott Honor citations, among numerous other awards.